Britt Julious (left) moderates a panel of journalists Rembert Browne, Doreen St. Félix and Wesley Morris in Harris Hall on Thursday. The panel discussed their personal experiences in newsrooms during a changing media landscape. 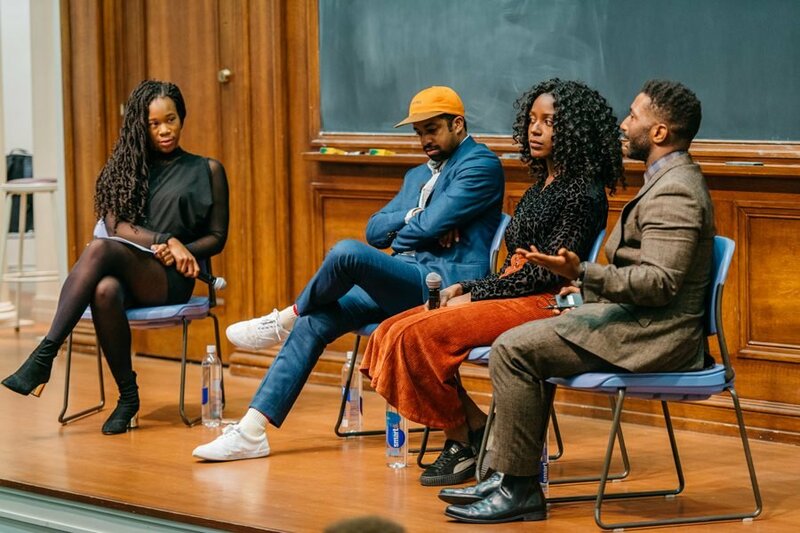 Three journalists spoke at Northwestern as part of a Thursday panel, discussing patterns in the changing media landscape and their experiences with diversity in newsrooms. The event, hosted by Contemporary Thought Speaker Series, featured Doreen St. Félix of The New Yorker, Wesley Morris of The New York Times and freelance journalist Rembert Browne. About 80 people attended the “Journalism in the 21st Century: Politics, Pop Culture & Protest” conversation in Harris Hall, moderated by journalist Britt Julious. Medill sophomore Amanda Gordon, a CTSS executive board member, said the journalists were invited to speak because they fuse their knowledge of diverse topics with personal experiences to present unique perspectives. “These people in some ways are like doctors, in that they’re able to diagnose what Americans are experiencing in a way that other people aren’t,” Gordon said. St. Félix, an entertainment writer and critic, said she immerses herself in pop culture, rather than simply watching politics, to get a better picture of the U.S.
As one of only two black women on her staff, St. Félix said editors have often asked her to write about issues that align with her identity. She said she is not always sure she has the appropriate opinion to represent that group. Morris said his current employer, The New York Times, struggles with diversifying its staff in both ideology and background. Though the newspaper recognizes the issue, it is still unsure of how to solve it, he said. He and Browne also said they experienced a lack of diversity when working at the now-defunct Grantland, a sports website owned by ESPN. Browne said he and Morris would confide in each other as the only two black people on staff, adding that it’s difficult to improve racial diversity in newsrooms when most people in positions of power are white. The panelists also discussed the current media climate. Morris said traditional criticism is becoming overshadowed by politics, as critics feel they have to celebrate diversity rather than look solely at the quality of the art. Browne also said the common “access journalism,” which relies on publicists to get in contact with sources, can create ethical dilemmas because publicists may expect positive coverage. St. Félix added that critiquing popular artists can kill careers by creating bad relationships with publicists. Iszy Hirschtritt Licht (Weinberg ’15), a program assistant for the Buffett Institute for Global Studies, told The Daily he has followed the journalists for years and enjoyed the opportunity to hear about their experiences in person.